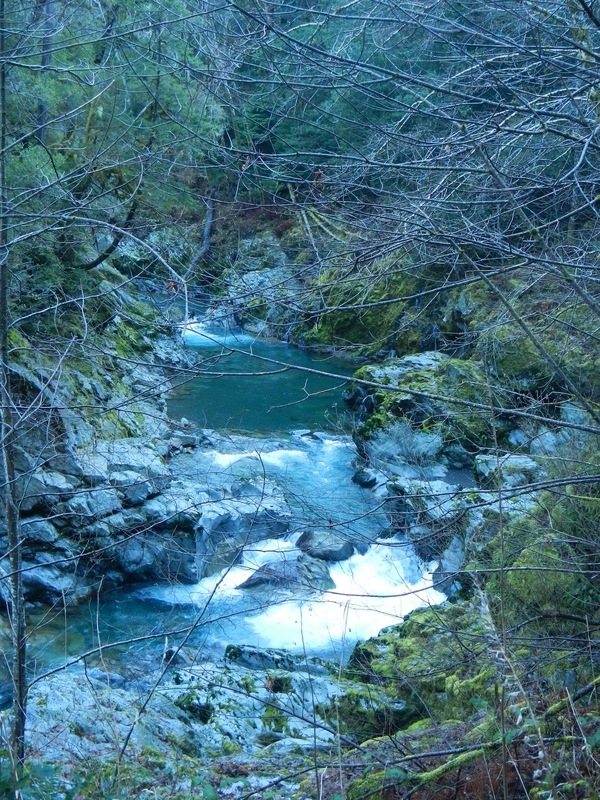 The Elk River is a small stream of transparent water and nearly heartbreaking beauty. Tucked away in Oregon’s southern coastal mountains, the Elk lies just north of the Rogue River and in the transition from the monotonous fir and cedar of the Coast Range to the much more diverse forests of the Klamath Mountains. The Logging Road Cyclist first had cause to visit the Elk in the Xmas-New Years gap of 1997, just after his (Armstice Day!) release from self-imposed exile in the drab New Mexican desert. 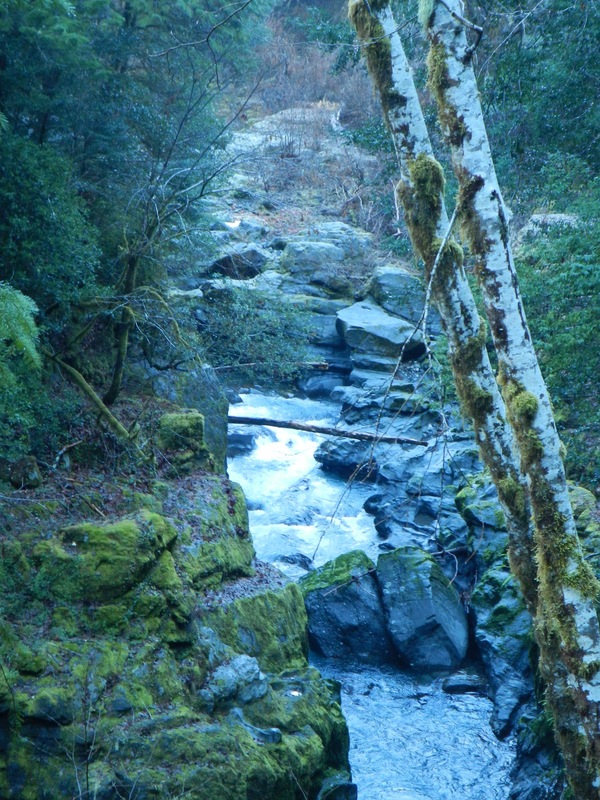 On their first boating date, TLRC and his (then to become) long-time boating buddy H., had gone down and run Canton Cr., a tributary of Steamboat Cr., which tributaries on into the North Umpqua. Canton was fun, and the boys got along, so, while outside the Glide laundromat they schemed up the Elk River trip. Back in those days, they thought nothing of heading off for yet another three-hour drive (in separate cars, for the shuttle) to do yet another river. The Elk was exotic, and supposed to be fun, so off they went into the cold night. The next morning, our heroes spent too much time getting acquainted and walking TLRC’s dog B. to get in a lot of paddling, but they still managed to run about 6 miles. To this day, TLRC has an almost physical memory of floating along this intimate little river with the drizzle falling down on his head, a soothing balm removing the chafes of the NM times. He was back on his misty cold rivers with his life back in his own hands. Towards the end of the day, drizzle turned to rain and then downpour. 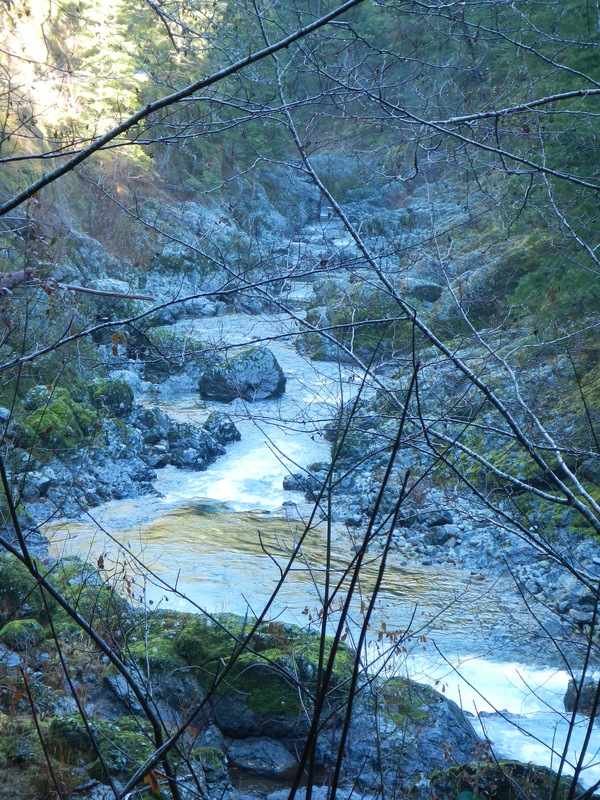 By the time they were on the road home, the river had come up a foot, and by the time TLRC had changed his blown tire on the very narrow edge of the very narrow road clinging to the wall above one of the Elk’s mini-gorges, the river was up perhaps three feet. Sliding on home, TLRC stopped at an espresso stand in Bandon and chatted up the teenager about the “Cheap Thrills” she was enjoying. TLRC, the atavist, had just re-bought it the month before, and was glad to see the hippie gene at least occasionally rising from dormancy. By the time he drove through Camas Valley late that night, there were inches of snow to push through and a pretty big desire to go back and see the Elk again. The next time was about 18 months later under a drastically different circumstance. A late, heavy snowfall in the Coast and Siskyou Ranges, followed by 80-degree weather was giving Sierra-like paddling conditions: hot weather and snowmelt. TLRC availed himself, first running the SF Coquille on a good flow and getting a sunburn (a far cry from the 40-degree February rain of the last time around), followed by an almost unimaginable day on the Elk. In shorts and lifejacket, TLRC did the whole run and saw the river in all it’s glory (and, for good measure, the MF Smith in CA that afternoon and the NF Smith with H. the next day, all in unseasonably hot weather). Years later, on a coastal vacation, TLRC and The Long-Suffering Girlfriend had ridden their bikes up the Elk. It was in the Fall, another beautiful Elk day. Part way along, they saw a couple of guys in a drift boat (there is perhaps a mile or two of the upper Elk that will allow this, and very limited access), knee deep in butchered king salmon, bloody water and slime, making notations in waterproof notebooks. Obviously a fishy census of some sort. TLRC, ever the wag called out: “Do you guys need college degrees for that job?”. Fortunately, they saw the humor in this too, and called back that they both had master’s degrees (presumably in Science). Just this week, in an effort to escape the Valley grey, TLRC and TLSG took a trip to Sunset Beach, the better to get fish and chips and take in the Xmas light show at Shore Acres. TLRC determined to ride up the Elk River from the hatchery up past the end of pavement and beyond to the Rogue divide. He prepared for this one. Armed with a 2006 publication describing not only the area geology but also the newly-discovered sheeted dike complex along the River, he was ready to note the Pearse Mtn diorite pluton and Humbug Mtn conglomerate (resistant rocks that host the little gorges the river cuts through) as well as the softer Galice Formation (yes, the same Galice) through which the river flows in the more serene sections. Nix to all that. At the hatchery, ice was all around. All the way up the canyon on the pavement, big patches of black ice lay waiting in every shady patch (most of the road at this time of year). Finally, at Butler Bar, where the gravel starts, TLRC had had enough, geared up and rode out. After 3 miles of dodging around sheets of ice 1″ thick that completely covered the gravel, TLRC (still vividly recalling the Unfortunate Events of 1/1/12 minus One, those involving a patch of ice, a bicycle and a comminuted, non-displaced fracture of the acetabulum) realized that while going up might be OK, coming down would be just as slow and more stressful. He bagged it and headed back to TLSG, a nice warm lunch and a long nap, vowing to include the Elk River in his projected Klamath Mountains Bicycle Transect. Mini-gorge in Pearse Mtn Diorite. Looking down the final gorge on the Elk, in the Humbug Mtn. conglomerate, beautiful rock with large rounded clasts.